This beauty was uttered by the contributor’s daughter. It is a mash up of “the greatest thing since sliced bread” (an excellent new invention) and I believe “older than dirt” (really old). Certainly sliced bread, when allowed to sit for awhile, gets old and moldy so I can see where the speaker may have conjured up that image when thinking of a really old person. Interestingly, this mixed idiom has been used to describe America’s sweetheart, Betty White. See picture below. A big thanks to Ron McDonald for hearing this one and sending it on! 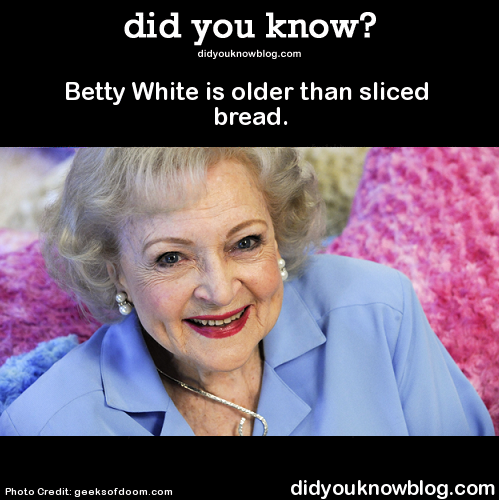 Betty white is literally older than sliced bread though, guys.